Using NASA's Hubble Space Telescope, astronomers at the University of Arizona captured the first direct, time-resolved images of an exoplanet, a young, gaseous exoplanet known as 2M1207b, shown above, located some 160 light-years from Earth. The planet is four times the mass of Jupiter and orbits a failed star, known to astronomers as a brown dwarf. And while our solar system is 4.5 billion years in the making, 2M1207b is a mere ten million years old. Its days are short–less than 11 hours–and its temperature is hot–a blistering 2,600 degrees Fahrenheit. Its rain showers arrive in the form of liquid iron and glass. "2M1207b is likely just the first of many exoplanets we will now be able to characterize and map," said Steward Observatory astronomer Glenn Schneider who co-authored the study with Lunar and Planetary Laboratory's Adam Showman released this February 16, 2016. 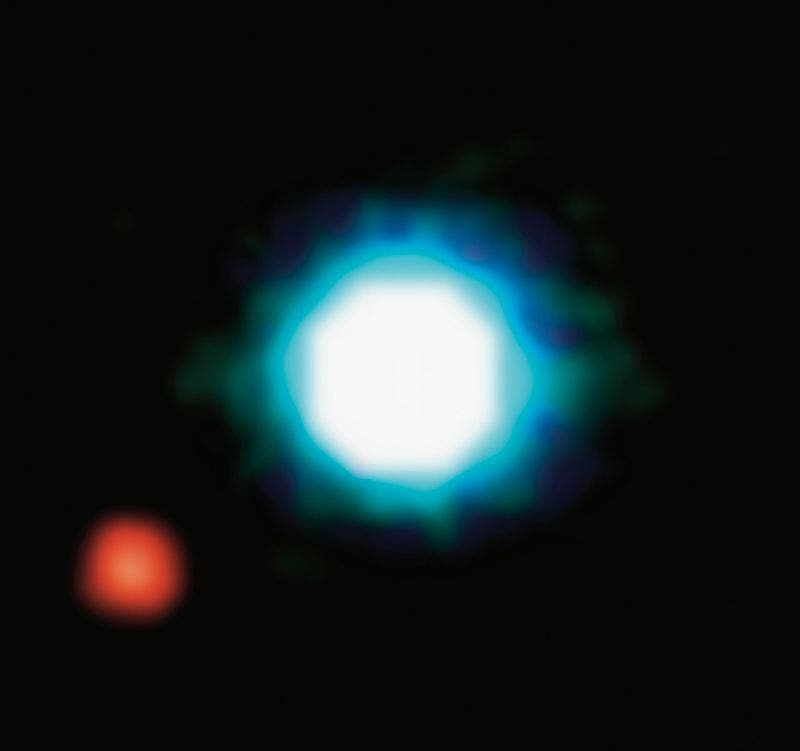 The composite image below shows the exoplanet (the red spot on the lower left), orbiting the brown dwarf 2M1207 (center). 2M1207b is the first exoplanet directly imaged and the first discovered orbiting a brown dwarf. It was imaged the first time by the VLT in 2004. Its planetary identity and characteristics were confirmed after one year of observations in 2005. 2M1207b is a Jupiter-like planet, 5 times more massive than Jupiter. The alien planet orbits the brown dwarf at a distance 55 times larger than the Earth to the Sun, nearly twice as far as Neptune is from the Sun. The system 2M1207 lies at a distance of 230 light-years, in the constellation of Hydra. The photo is based on three near-infrared exposures (in the H, K and L wavebands) with the NACO adaptive-optics facility at the 8.2-m VLT Yepun telescope at the ESO Paranal Observatory. The researchers, led by UA Department of Astronomy graduate student Yifan Zhou, were able to deduce the exoplanet's rotational period and better understand its atmospheric properties–including its patchy clouds–by taking 160 images of the target over the course of ten hours. Their work was made possible by the high resolution and high contrast imaging capabilities of Hubble's Wide Field Camera 3. Before now, nobody had ever used 26-year-old Hubble to create time-resolved images of an exoplanet. Even the largest telescope on Earth could not snap a sharp photo of a planet as far away as 2M1207b, so the astronomers created an innovative, new way to map its clouds without actually seeing them in sharp relief: They measured its changing brightness over time. Hubble's Vivid New Images of Jupiter's Polar Aurora –"Larger than Earth"